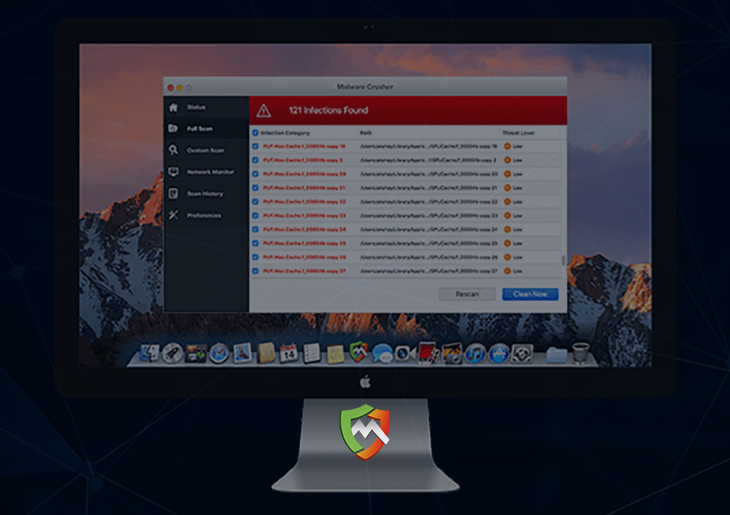 Learn what type of trickery the Malware Crusher virus uses to propagate and get an effective methodology for removing this rogue security product from Mac. The saying that goes, “All that glitters is not gold” holds true for software environment just like it does for physical world. Applications that look neat and trustworthy don’t necessarily deliver features they claim to. In the worst-case scenario, such rogue programs may deceive users on purpose, just to trick them into paying money for a fix that’s not actually needed. Malware Crusher, an app that supposedly detects and removes malware, adware and other potentially unwanted programs (PUPs), returns exaggerated scan results to pressure users into activating its full version. Meanwhile, the majority of reported items are harmless cache files and regular cookies that cannot be labeled as critical threats. Yes, these entities do cram up macOS and may affect system performance, but they aren’t nearly as menacing as the scareware in question says they are. The overstatement of one’s current system health issues isn’t the only controversial thing about Malware Crusher, though. It makes the rounds by accompanying other software, where the presence of this bundle is hardly ever clear during the installation. In other words, the rogue application slithers its way into Macs alongside innocuous freeware downloaded via setup clients. There is generally nothing wrong about app bundling as such, but this technique has become one of the main adware distribution vectors over the past several years. To avoid this type of social engineering, it’s recommended to opt out of the default installation option and deselect every suspicious entry posing as a “special offer” or similar. Ultimately, the dubious program under scrutiny ends up on computers out of the blue rather than be knowingly installed by users. Malware Crusher configures the infected host to trigger its process upon every macOS startup. Once launched, it displays a GUI that imitates a system scan for malicious code. Each one of these scanners ends with a report stating that dozens or even hundreds of infections have been spotted. To add insult to injury, the rogue AV tool also displays annoying popups that remind the victim of urgent need to clean up the purportedly detected threats. Not only does this malicious activity interrupt the user’s normal work or entertainment, but it also eats up the target Mac’s processing power appreciably. So, be sure to follow the instructions below and remove Malware Crusher baddie. 1. Download and install MacBooster application (read review). The tool provides both optimization and security features for your Mac. Before you get down to obliterating Malware Crusher adware proper, consider checking your machine for other security risks and performance issues by hitting the Scan button. 2. Proceed to the Uninstaller feature, find Malware Crusher on the Applications list and have MacBooster completely eliminate all components of the app from your Mac by clicking Uninstall in the bottom part of the GUI. Doing so will ensure all components of the malware and its remainders, which may have not been removed in the manual way, will be thoroughly cleaned up.